The Penny. In God We Trust. What's a penny worth. Well, a penny. Yet it's easy to dismiss a penny, something of so little value. In fact the penny, the lowest coin or currency in the United States monetary system, is thrown away as worthless by some. 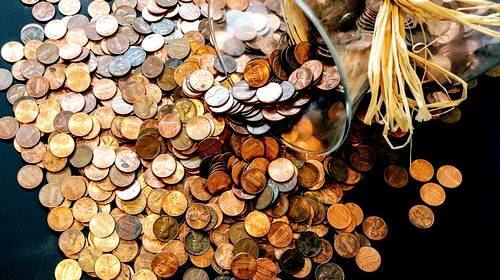 This story offers a different perspective of the penny, a coin of great worth. Several years ago, a friend of mine and her husband were invited to spend the weekend at the husband's employer's home. My friend, Arlene, was nervous about the weekend. The boss was very wealthy, with a fine home on the water-way, and cars costing more than her house. As the three of them were about to enter an exclusive restaurant that evening, the boss was walking slightly ahead of Arlene and her husband. He stopped suddenly, looking down on the pavement for a long, silent moment. Arlene wondered if she was supposed to pass him. There was nothing on the ground except a single darkened penny that someone had dropped, and a few cigarette butts. Still silent, the man reached down and picked up the penny. He held it up and smiled, then put it in his pocket as if he had found a great treasure. How absurd! What need did this man have for a single penny? Why would he even take the time to stop and pick it up? Throughout dinner, the entire scene nagged at her. Finally, she could stand it no longer. She causally mentioned that her daughter once had a coin collection, and asked if the penny he had found had been of some value. A smile crept across the man's face as he reached into his pocket for the penny and held it out for her to see. She had seen many pennies before! What was the point of this? "Look at it." He said. "Read what it says." She read the words "United States of America." "No, not that; read further." "No, keep reading some more." "And if I trust in God, the name of God is holy, even on a coin. Whenever I find a coin I see that inscription. 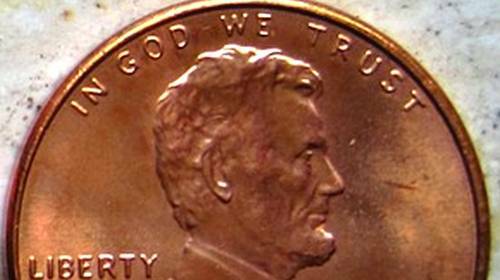 It is written on every single United States coin, but we never seem to notice it! God drops a message right in front of me telling me to trust Him? Who am I to pass it by? When I see a coin, I pray, I stop to see if my trust IS in God at that moment. I pick the coin up as a response to God; that I do trust in Him. For a short time, at least, I cherish it as if it were gold. I think it is God's way of starting a conversation with me. Lucky for me, God is patient and pennies are plentiful! When I was out shopping today, I found a penny on the sidewalk. I stopped and picked it up, and realized that I had been worrying and fretting in my mind about things I can not change. I read the words, "In God We Trust," and had to smile. Yes, God, I get the message.